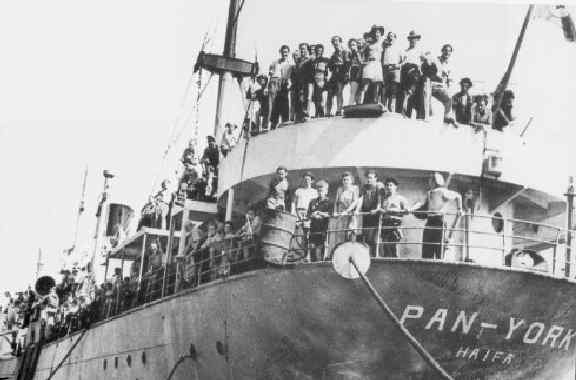 The two “Pans” were manned by American volunteers, and brought the largest contingent in two ships totaling over 15,000 persons. The British used all means to prevent their sailing, and the Jewish Agency voted to cancel the sailing, but the chief of Mossad, Saul Avigur, refused. There were over 1,000 children under five, 4,000 unaccompanied older children, and 6,000 youths. 55 doctors were on the passenger list, and six babies were born en route. Organization was carefully worked out. The ships were boarded by agreement by cruisers Mauritius and Phoebe. Passengers could retain their luggage. The ships went directly to Cyprus where disembarkation took four days. Book: “Voyage to Freedom” by Ze’ev Venia Hadari and Ze’ev Tsahor.